The tale is familiar, as it draws inspiration from many fairy tales, including Hans Christian Andersen’s The Little Mermaid. Rusalka, a beautiful water nymph, falls in love with a prince, sacrificing her voice in return for entry into his human world. But betrayal condemns her to eternal solitude. Dvorak juxtaposes the mortal and the mythical with beautiful folk melodies and luminous arias. Kelly Kaduce returns to the stage in a reprisal of Minnesota Opera’s critically acclaimed production. 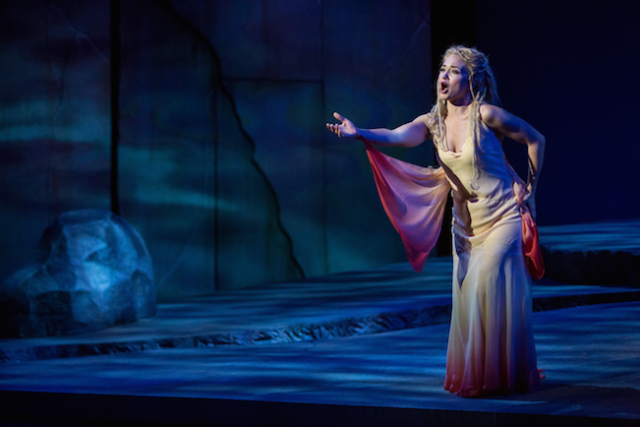 After performing with Minnesota Opera as the tragic water nymph in 2008, Kaduce, a native Minnesotan, has become the opera world’s “go-to” Rusalka. Kaduce’s affinity for the character goes back to the earliest days of her flourishing career: she won the 1999 Metropolitan Opera National Council Auditions with her performance of Rusalka’s heartbreaking aria, “Song to the Moon.” After her role debut at Minnesota Opera, she went on to perform it throughout North America. 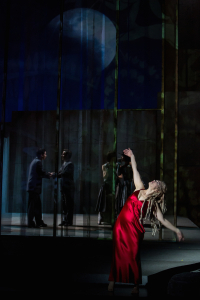 The opera world has considered you a kind of “go-to” Rusalka for the last several years. What does it take to become sought-after in this role? Kelly Kaduce: Being able to pronounce the Czech language is a key factor! The most common languages for opera are Italian, German, and French, and learning these languages is a standard part of our training. There are only a handful of Czech operas that are popular for current day performance, and learning Czech is not a standard part of training, so learning how to pronounce Czech turns into an individual pursuit. Once you have learned the role and had success with it, I would chalk it up to word of mouth! Is it common for opera singers to specialize in a role like that? KK: It’s a myth that we opera singers plan and carve out our careers. Perhaps that’s a secret I shouldn’t divulge! In truth, it goes more like this: “You want me to sing what? OK, let me check out the score… I can sing all those pitches… and yes my schedule is free… and you are going to pay me?! I’ll be there!” It is really other people that have made Rusalka a specialty role for me. What do you bring to each new production of Rusalka to keep you from getting bored with the role? KK: There is always something to work on. I never get bored singing a repeat role. I always find something I want to improve on! The cast and musical staff is always changing as well. Each person comes with different ideas, and that is when the fun of collaboration begins. By the time the production goes up, it feels like a completely new product! What are some of the challenges and joys about playing a water nymph? What draws you to the role? KK: Definitely the music is the biggest draw. The Rusalka score is lush and gorgeous and is a showcase for the lyric soprano voice. Put simply, it is an evening of goosebump moments. What draws me to the character is her belief in something greater than her own very existence. I am a sucker for characters who are willing to “throw themselves under the bus” in pursuit of beautiful ideals. It is interesting to see that as Rusalka dares going after what she wants, she is robbed of her voice and her expression. As a modern woman, how do you relate to the character in its themes of her ill-fated pursuit of her desires and her freedoms? KK: Folk tales are popular because they speak so deeply to our human desires. All living things need and want to connect physically and emotionally. What and whom we connect with isn’t always what we or others would choose for us. Rusalka faces rejection from her world, from her lover’s world, and all in between. Yet she still feels triumphant because for a brief moment, she did experience the connection of deep, profound love, and she would do it all again regardless of any pains she has to endure for eternity. Isn’t that a beautiful idea?! Rusalka runs at the Ordway Center for Performing Arts through January 31. For more information and to purchase tickets, head to www.mnopera.org.